These are the terms and conditions to which you agree when entering your work in the exhibition. There will be a non-returnable fee of £2 per painting, payable on submission evening. - Work will only be accepted from members who have fully paid their membership fee. Please bring your membership card with you on submission evening. - Membership fees cannot be accepted on submission evening. - All work submitted must be accompanied by a completed entry form. - Pictures must be adequately framed and fitted with mirror plates. - Screw mirror plates half-way down on the horizontal plane. - All other hooks and screws should be removed from the back. - The mirror plates must be fixed to the frame by the exhibitor and all screws must be covered with tape. - The picture must be sealed into its frame on the back. - Oil and Acrylic paintings on board or canvas will be accepted unframed providing they are mounted onto a wooden frame (behind) with adequately fitted mirror plates. 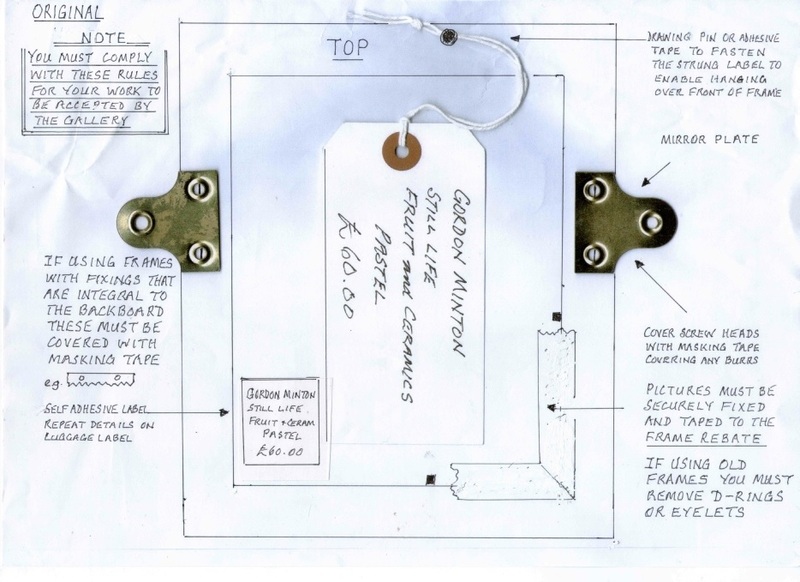 - Attach a luggage label with string to the back of the frame so it can hang over the front by 10 cm. - Suggested label size (4” x 2.5”) (10 cm x 6 cm). - In addition, a label with identical information should be stuck to the back of the work. There will be a panel of 2/3 selectors who will decide which work is to be exhibited. At least one per member is guaranteed. Please note that if you require your work to be insured you are advised to take out your own personal insurance. The Gallery do not cover any of the works until the beginning of the install week and none of the unselected works will be insured. Salford Art Club does not accept responsibility for loss or damage to exhibits whilst in their possession. - The Gallery will take 30% commission plus VAT on any work sold. - The Gallery are responsible for collecting payments for work sold. - All money, less commission, will be passed to Salford Art Club who will then forward payment to individuals. ​ Awarded for the donor’s choice of the best painting in the exhibition. Awarded for best in the exhibition in the opinion of the General Public.